highlighting the need to reassess business models. It is one of the most popular books on business models (average of 5 stars from 138 customer reviews at Amazon) but to my surprise I found it mediocre in both content and structure. The book is much too long for the points it delivers and the authors do not dive into the subject of business models more than briefly. It is a basic book on marketing with some ideas and questions relating to One-sided business models. 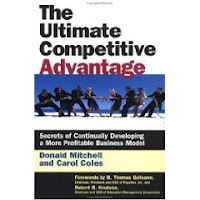 It is filled with obvious statements such as "Be hard to overtake" without any discussions about unique assets, capabilities, processes or Control Mechanisms, and uses headings such as "Provide sustained benefits for all stakeholders" but in text only focus on customers. If you plan to operate a lemonade stand this book is perfect for you. If you read the book I look forward to your comments!